Welcome to the next generation of cool, creamy, caffeinated dairy-free drinks. Califia Nitro Cold Brew is a new style of iced coffee that’s meant to be experienced like a good micro brew. Just a few years ago, I was in awe when a dairy-free iced coffee beverage finally emerged. Now, it’s an expansive business with numerous brands and flavors competing for shelf space. 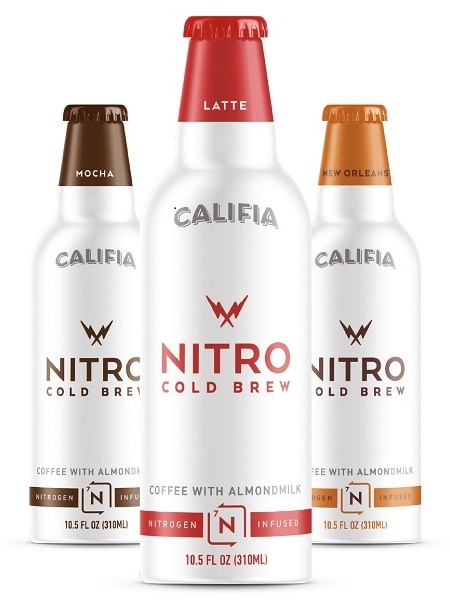 But Califia Farms is poised to become the clear leader with their latest innovation, Califia Nitro Cold Brew. The java is seamlessly blended with creamy macadamia and almond milks, infused with nitrogen, and packaged in sleek single-serve aluminum bottles. The Califia Nitro Cold Brew production process results in a “micro-foam” that is a bit hard to describe. Califia Farms likens it to a craft beer experience. However, we didn’t agree. We thought the head was creamier, shorter and less effervescent than the description implies. This isn’t a carbonated drink in any way! In terms of nutrition, Califia Nitro Cold Brew Coffee Drinks are seriously fortified with calcium. Each bottle contains 60 percent of the RDA. 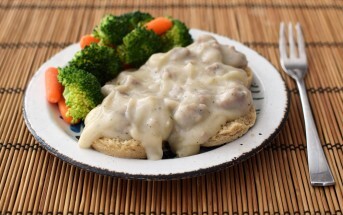 They also have a little dose of protein (2 to 3 grams) and are modest in fat (7 grams). But overall, they’re still an indulgence. The sugars vary widely, with 18 grams in the Mocha, 11 grams in the New Orleans, and 10 grams in the Latte. But more importantly, how do they taste? As many of you know, I really don’t like coffee. So I enlisted my good friend Caroline to weigh in on each flavor. It has a strong coffee flavor and is nicely creamy and cocoa-y, without being too decadent. It’s sweetened just enough to be a special treat. It isn’t over the top like a Starbucks “dessert” drink though. Caroline definitely enjoyed savoring this one, and we did notice that the foam began to rise to the top after a few minutes. This was bitter and disappointing. After sampling the Mocha, Caroline was expecting something sweet, but the flavor was flat and “pretty average”. Nonetheless, when she poured it quickly into a glass, it did fizz up nicely for a great consistency. If you’re one to reach for strong black coffee, this would be the variety for you. But Caroline likes her lattes sweet. Getting back on her good side, Caroline said this one was “very yummy!” It has an interesting sweet and nutty flavor that she would enjoy serving to guests at a brunch. In terms of the micro-foam, Caroline thought it was exciting and fun when you pour a Califia Nitro Cold Brew. She said the foamy finish really added to the overall enjoyment. But if you drink it from the bottle, you miss the experience. So while it looks like a great on-the-go drink, she much prefers it served with a glass full of ice. This picture is courtesy of Califia Farms. We didn’t get a “settled” shot, and I wanted to show you how the micro-foam can look after a few minutes. However, we only saw a similar head on the Latte flavor. The Mocha was more richly foamy and not so pronounced. 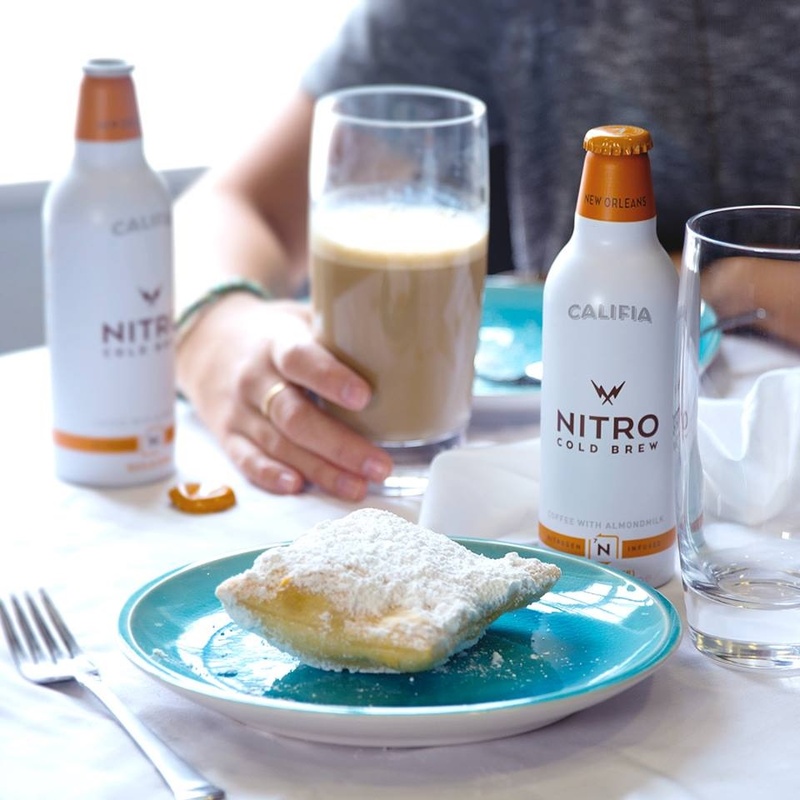 Availability: Califia Nitro Cold Brew Coffee Drinks are rolling out first in stores like Target and Whole Foods in the U.S. But like most Califia Farms products, they should enjoy broader distribution soon. Certifications: Califia Nitro Cold Brew Coffee Drinks are Certified Kosher Pareve. They’re also labeled as non-GMO, vegan and gluten-free, but we didn’t see these certifications. 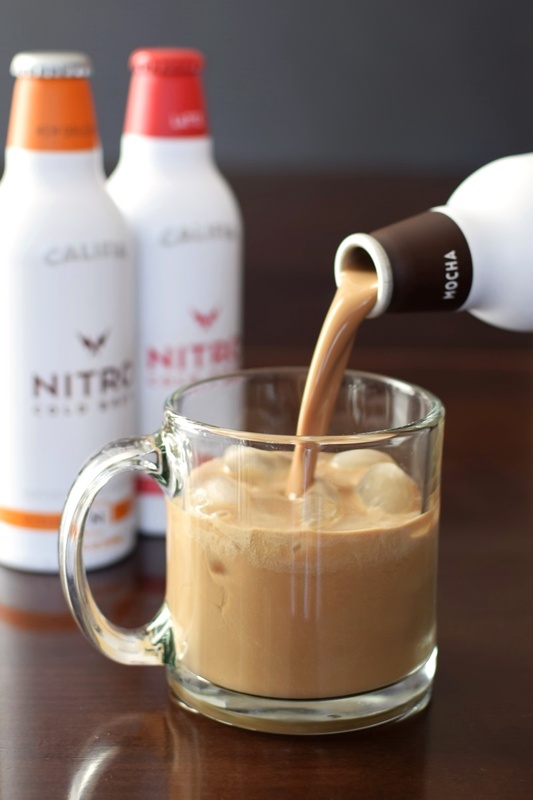 Dietary Notes: By ingredients, Califia Nitro Cold Brew Coffee Drinks are dairy-free / non-dairy, egg-free, gluten-free, peanut-free, soy-free, carrageenan-free, vegan / plant-based, and vegetarian. Nonetheless, check with the company on their manufacturing processes for all varieties if potential allergen cross-contamination is an issue for you. Processes and labeling are subject to change at any time for any company / product. 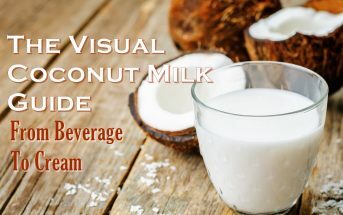 Each chilled, lightweight aluminum bottle is filled with a signature java blend made from direct-sourced beans and creamy macadamia-almond milk. It’s then nitrogen-infused for a wonderful micro-foam finish that’s best experienced in a glass. As for the taste, the Mocha was a sweet, cocoa-y hands-down winner. The New Orleans was nuttier, yet equally creamy and delicious. However, our taster wasn’t pleased with the Latte, which lacked sweetness and is better suited to latte purists. what about the fact that you apparently need a beer opener thing to get it opened?! who even has those? This looks so amazing! Must find this ASAP. I’m all about cold brew right now, it tastes amazing! This dairy free option seems lovely! Can’t wait to try this!